Jackie pulls the injured baby from the wreckage as motorcycle policeman Casey Guthrie reaches the scene. The woman in the car is dead. With no time to waste, Casey transports Jackie and the infant to the e.R. on his motorbike. But attempts to find the baby girl’s identity lead to a chilling conclusion–the woman in the car was a kidnapper. The baby’s fate is now in the hands of Jackie and Casey…and in their hearts. In cities all over North America, traffic accidents are a tragic fact of everyday life. People are injured, sometimes they die, and many lives are changed forever. But can good ever come from bad? In this book I have two of the most daring characters I have ever written about. 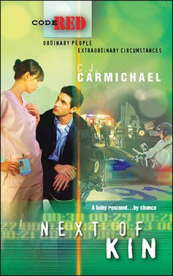 Motorcycle cop, Casey Guthrie, and emergency room nurse, Jackie Kellison, are people of strong convictions. When it comes to doing the right thing, they’re not afraid to put their careers—or their lives—on the line. When it comes to her heart, however, Jackie is much more protective. This is also one of the most action packed stories I've ever told--from the tractor trailer jackknifing accident at the opening of the book, to the final kidnapping/chase scene. I think readers will especially enjoy the twists and turns as they try to puzzle out the mystery behind all the action. But of course this story is about so much more than adventure and intrigue. It is at heart a love story between two memorable characters. Jackie Kellison is an ER nurse who has such a big heart and doesn't realize her own extraordinary qualities, while Casey Guthrie, a motorcycle cop, is the kind of charming, dashing guy who always turns the ladies heads. Only, once he meets Jackie, Casey suddenly loses interest in any other woman but her. When the airbag deflated, Jackie Kellison was able to catch her breath. She flexed her hands, wiggled her toes, and decided she was okay. Her neck ached a little, but that was all. Around her the cacophony of the accident had died down. In the sudden silence she heard people calling for help. How many drivers and passengers had been injured? She scrambled for the cell phone she kept in her glove compartment for emergencies and dialed 911. The dispatcher seemed already aware of the incident, but still asked several questions. Ignoring a painful protest from her neck muscles, Jackie reached under the passenger-side seat for her first-aid kit. After being assured that help was on its way, she disconnected from her call and dropped the phone. She had to get out of here and see if she could help. She grasped the door handle, but even with a good shove from her shoulder, couldn't get the door to budge. Her beautiful new convertible was totally wrecked. On shaky legs she stood up on her seat. Before coming to a final stop the tractor-trailer rig had crossed the center-line and now traffic stood at a complete halt on both directions of the highway. God give me strength, she prayed as she climbed out the open roof. The awful sounds of crying and moaning and entreaties for help were everywhere now. She hardly knew where to turn. The bright sun suddenly seemed an abomination. She'd never seen such devastation first hand. In front of her was a tangle of metal and shattered glass. Just ahead of the over-turned rig, a sedan burned wildly. Had the occupants made it out before the blast? She prayed so. "Please, help me! My son is bleeding badly!" The woman driver from the car in front of Jackie's had managed to open the driver's side window of her own car and was waving at her. Jackie sprang into action, scrambling over the torn metal of the Mazda's hood, then jumping down to pavement and racing to the woman's aid. "Where is he bleeding?" She was pulling on a pair of disposable latex gloves as she spoke. Peering in the passenger window, Jackie saw a boy about fifteen or sixteen, strapped into the front passenger seat, shifting restlessly. Bright red blood spurted from a cut artery in his upper arm. She grasped the door handled and tugged. "How about you?" she asked the mother. "Are you all right?" "I'm okay. Just please, please, look after Brayden." Jackie wasn't convinced. The woman had the beginning of a bruise on her forehead, but she was conscious and talking and able to move. The son was the priority right now. The door jammed. She put a foot against the car and tugged with all her might. To her amazement, the door fell to the road. She leaned in for a closer look at the boy. His respirations were rapid and shallow. "Hi there, Brayden. That's quite a nasty cut you have." She was glad to see his eyelids flutter when she spoke to him. Pulling off her cardigan, she used it to stem the flow of blood. His mother was at Jackie's side now, having extracted herself from the driver's side of the car. "Is he going to be okay?" "I think so." She hadn't had a chance to inspect for other injuries, yet. She had thick absorbent pads and bandages in her kit and did her best to dress the wound. As she worked, she spoke calmly to the mother. "We need to stop the flow of blood until help arrives." The matronly-looking woman stared at her blankly, probably in mild shock. "Here." Jackie took one of the woman's hands and placed it over the bandaged wound. "You need to apply firm, direct pressure right here. Can you do this?" "Good. Help will be here soon and your son will be fine. Be strong." She clasped a hand on the woman's shoulder, then slipped on her stethoscope to continue her examination. The boy's pulse was fast, but thready. She took one of his hands and squeezed it gently. "Can you hear me, Brayden? If you're too tired to talk, then squeeze my fingers." Nothing. He was probably in shock, too. "Do you have anything warm in your van?" she asked the mother. "A sleeping bag from my son's sleep-over last weekend." "Great. Can you get it?" She kept pressure on the wound and managed to recline the boy's seat to a supine position, while the mother found the sleeping bag. "Keep him warm," she told the mother, then, noticing that she had started to shake,"actually, why don't you crawl under that sleeping bag with him? Moving on, she saw several people with minor injuries--a man with an obviously fractured arm, a woman with superficial abrasions on her face. They could wait. The motorcycle cop who'd let her go earlier had cordoned off the accident site and was trying to clear a lane for the emergency vehicles, without much apparent success. She saw him glance her way and nod. She nodded back, then tore off her soiled gloves and replaced them with a clean pair. A male driver in his fifties moaned for help from the driver's seat of his badly damaged Volvo. He'd managed to open his door and now he was crying out. "Oh, my God, It hurts so bad. I know I'm going to die!" Eyeing his pallor and noting the way he was clutching his right hand to his left shoulder, Jackie was immediately concerned. "Sir, I'm a nurse. Maybe I can help. Can you tell me what the problem is?" "The pressure..." he gasped. "I can hardly breathe." "Any history of heart disease, sir?" "Yeah. I have angina. About five years ago I had a heart attack. It was just like this. Oh, God, I'm going to die this time, I know it." "Do you have your nitro spray?" "In the glove compartment. I can't--"
"That's okay. I'll get it." She ran to the other door and quickly found the spray."Here. Take this." He eagerly sprayed two shots under his tongue. Almost immediately he showed improvement. As an added precaution, Jackie gave him an aspirin to chew, then she flagged down an uninjured accident victim and asked the young woman to sit with the man until the paramedics arrived. She scribbled quickly on a post-it note from her kit and handed it to the quiet young woman. "Give this to the paramedics when they arrive so they'll know what I've done." She patted the man's hand reassuringly, then moved on again. This time she could hear a young woman calling for help. "Get me out of here! Get me out!" She was in the front seat of a small two-door car and several people were trying to open one of the doors without success. Jackie rushed to the scene and stepped forward with authority. When they saw her first aid kit and the stethoscope strung around her neck, people stepped aside to allow her access to the driver's side of the totaled vehicle. The damage to the car was so severe, it seemed impossible the woman inside could still be alive. But she was alive and conscious, too, though frantic with fear, pain or probably both. "My legs are trapped. I can't move them!" Strapped in her seat, her air bag had deployed, saving her from massive head and neck injuries. But Jackie didn't discount the possibility that there could be some injury to the spinal cord. "I know you must be in terrible pain, Miss, but we'd better not move you until the paramedics show up. Can you wiggle your toes?" she asked hopefully. "Nothing! Am I going to be paralyzed?" She was a good-looking girl, probably in her mid-twenties. "Perhaps you've lost feeling due to a lack of circulation," Jackie said, offering hope. She glanced around at the crowd. "Anyone got any thick jackets, towels or blankets?" "I have some towels. They're a little damp..." A woman in a sundress, who'd obviously spent the day on the beach, offered two striped towels from a wicker bag. "That's fine." Jackie took them gratefully and did her best to immobilize the young woman's neck. The reassuring sounds of sirens were all around them now. But how were the ambulances going to be able to transport these people to the hospital? The traffic snarl continued on both sides of the highway for as far as she could see. She wondered if her brother Nate was on duty today. Boy, she could sure use his help out here. Jackie stood, pressing a hand firmly to the side of her neck where the muscles were throbbing now. She'd worked her way right up to the tractor-trailer unit. The driver seemed to be okay. He was upright in the sideways cab, free of his seat belt and talking to two men who'd emerged from their wrecked vehicles to give him a blast. Over on the far left, she watched as the paramedics spilled from two ambulances. Jackie almost cried with relief when she saw her tall, dark haired younger brother emerge from the driver's side of the first vehicle dressed in his navy uniform. Somehow, above all the noise and commotion, he heard her. She saw him frown. She wound her way through the maze of demolished cars and accident victims. "I was here when it happened, Nate. My car is probably totaled, but I'm fine." Her brother engulfed her in a hug and she winced at the pain that shot from her neck down her shoulder. She pulled away gently. "I've been around to most of the victims." She told him about the bleeding boy who was in shock, the man who was almost for sure having a heart attack, the trapped young woman who couldn't feel her legs. "Good work, Jackie." Nate patted her shoulder, already signaling the other paramedics where to go. She left her brother to do his job, thankful that he was here, though still concerned about the inevitable long transport times. About to make her way back to her car, Jackie paused when she heard a faint wail. Unlike the cries and moans around her, this one was higher pitched and steady as a stream of water from a faucet. The sound was unmistakable to anyone who'd heard it before. Jackie's heart jammed up in her throat. The sound was traveling from the other side of the tipped trailer. Dropping to her knees, she could see that the front end of a station wagon which had been trapped under the collapsed rig. She tried calling out to the mother or father of the infant, but no one responded. Sick fear momentarily froze her as she eyed the huge barrier that stood in her way. She had to get to that baby. But the vehicle was blocked between the over-turned rig and the burned-out sedan. Suddenly she felt a hand on her shoulder. She turned and looked up with disbelief. It was the motorcycle cop she'd passed on the highway, just minutes before the accident. He'd whipped off his helmet and his light brown hair was damp with sweat. Their eyes met with common understanding. He'd heard the cries, too. He paused, then nodded. "Okay then. Let's help that kid." He laced his fingers and without a second thought, she stepped her sandaled foot onto the perch. "One, two, three..." He heaved as she reached up, and soon she was standing on what had once been the side but was now the top of the trailer. She scrambled quickly to the other side, the metal hard on her bare knees. The cop followed. He was right next to her when she finally saw the remains of the trapped vehicle. The front half was crushed under the back end of the trailer. In the rear seat, she could see the outline of an infant carrier. She shared the cop's opinion. He held out his hand again, and helped her down to solid ground. "Be careful of the glass," he said. Pellets of the stuff lay everywhere around them. He whipped off his leather jacket and used it to kneel on so he could get a look inside the front seat of the car. She turned away, focusing on the wailing baby. The rear door was jammed, but the window had smashed into a million pieces. Taking a cue from the cop, she slipped off a sandal and used it to sweep away the residue, carefully ensuring that the glass pellets fell to the street and not in the car with the baby. "Hey, sweetie," she called softly. "Are you okay in there?" The wailing halted, but only for a split second. She was encouraged that the baby had responded, even momentarily, to the sound of her voice. She leaned in through the window for a closer look. "Oh, God." Instinctively she drew back. Closed her eyes. "What's wrong?" Still on the ground trying to see into the front seat, the cop must have heard her cry out. She spotted the plastic frame of a mirror and shook her head at the mother's foolishness. "You're going to be okay, sweetie. Let me see if I can get you out of that car seat." She would have preferred to leave him in the padded carrier, but no way would she be able to get the awkward thing through the window. Quickly she released the metal catch at the bottom, then pushed aside the canvas straps. "Okay, baby. You're coming out." As gently as possible she lifted the little thing--ten pounds at the most--from the seat and through the window. Finally the wailing stopped as she held the child in her arms. There were more cuts on his arms and legs, and some on his scalp, too. Jackie checked for shards of glass, wishing for a table, direct lighting, and good quality tweezers. "He okay?" The cop was standing again. Keeping a careful distance from her and the baby, he shook the glass out of his jacket, then slipped it back on. Jackie continued her inspection of the infant. "Lots of lacerations, but most of them superficial, I hope. I'm most worried about his eyes." Both were puffy, but the right one was also bleeding. She mopped up the blood with some gauze and saw that his eye-lid was lacerated and--even worse--a fragment of glass appeared lodged in his cornea. She wrapped the blue blanket around his tiny body, frowning at the way the little guy turned his head from the slightest exposure to sunlight. Not a good sign. Poor babe. "If his injuries are as extensive as I fear, he needs to be seen by a surgeon right away." What she could see of the injury was bad enough. But she was most worried about potential damage to the internal ocular structures. She thought the cop was referring to the baby's injuries, but then she noticed his gaze dwelling on the front half of the crushed vehicle. He shook his head gravely. "I'm afraid the baby's mother is dead."